Example provided by:Stevens, A.-D., Droege, G., Zippel, E., Häffner, E. & Borsch, T.
The Botanic Garden and Botanical Museum Berlin acts in accordance with the national and the EU regulations and international agreements on genetic resources. As a member of CETAF and GGBN our workflows and documentation of our biological collections are in compliance with both CETAF’s and GGBN’s codes of conduct. A main obstacle to compliance with all the requirements coming from these different sources that we have encountered was to guarantee the comprehensive, transparent, and traceable documentation along our internal workflows evolving with the development of a manifold of protocols. For the purpose of basic taxonomic and biodiversity research, education, and conservation we receive genetic resources as living plants, seeds, tissue samples (for DNA-extraction), environmental samples and herbarium specimens from sources all over the world and through own collecting activities. As a result, our herbarium collections grow by approximately 35.000 new specimens per year; thousands of samples, culture strains and seeds enrich the other collections and also a few hundred living plants are exchanged with other botanical gardens each year. We receive the very heterogeneous material from many different countries worldwide and accordingly the use, storage and distribution is subject to very different conditions and restrictions. It is important to ensure that the material that is blocked for e.g. transfer to third parties or detailed publication, is not published via public databases (GGBN, Index Seminum, GBIF). As we decided to adopt and adapt a new network based database solution (called Jacq) for our herbarium collections we also decided to formally establish a common workflow that considers and integrates all our biological collections. This includes the documentation of DNA samples and plant tissue collections within the GGBN network software solutions which at that time in 2013 was under rapid development, too. We also of course had to integrate the existing database routines of our living collections and the Dahlem Seed Bank database. Fig. 1. Overview of different types of incoming material into the Botanic Garden and Botanical Museum Berlin and the units that handle the samples and specimens and the respective formal documentation i.e. legal documents. These challenges presented the opportunity to develop protocols to cover the handling, collecting, and processing of the specimens that had accumulated over the long history of our collections and our databases. 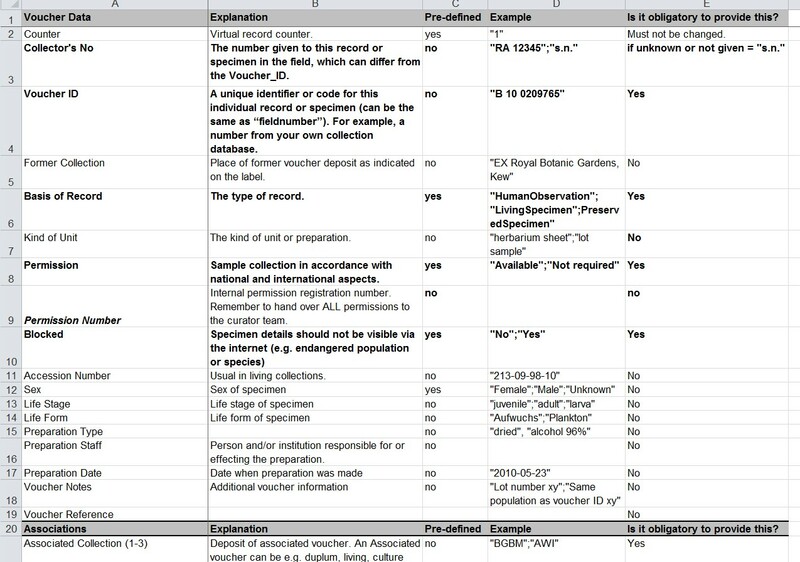 Basically we developed a common collection data format tool to guarantee all necessary documentation. This CDF tool is obligatory for all our own collecting activities and all material entering our collections needs to be accompanied with these mandatory data. We require a minimum of documentation before we accept external collections (mostly older collections from public or private sources). All legal and formal documents (e.g. collecting permits, PIC, CITES documentation, phytosanitary documents, MTA, long term agreements with partner institutions, project agreements etc.) are digitized and managed using a digital asset management software (we use Alfresco, an open source document management system http://www.alfresco.com)). Fig. 2. Permit Management at BGBM with Alfresco. Each accession lot and field excursion is related to a registration number, e.g. “2016_02”, containing all required documents. The url to this folder is stored in our collection databases. The registration number will be published through GBIF and GGBN, but not the documents. All of our collections (tissue and DNA-samples as well as living plants, seeds and diatom cultures) must have, if possible, a herbarium specimen that can be permanently stored guarantees the correct taxonomic identification of the material. All of these voucher specimens are digitized. Therefore, all data and all documentation can be traced back to identifiers referring to a herbarium specimen and all of the other collections (samples, probes and specimens) also get unique identifiers that are cross-referenced with the herbarium specimen identifiers. However, as the activities and pathways of incoming material differ quite a lot (e.g. seeds via Index Seminum vs tissue samples for DNA extraction and herbarium collections) and are located at different places and treated by different staff, we decided to have two locations where incoming material is checked for appropriate documentation. These are the central documentation office for living material (plants and seeds in the seed bank) and the central documentation office of the herbarium (for herbarium specimens and tissue samples). In both places, according to the main purpose for accessioning the new material, all relevant documents are digitized or received digitally and are assigned a unique identifier in order to link the documents to the specific genetic material collected. It is the responsibility of the collectors or the donators of plant material to link the documents to the plant material covered by the documents. If collected by our staff, this linking of identifiers is done using the CDF mentioned above. The documentation offices do check the data and documents but the collectors hold full responsibility for obtaining the correct documents, according to their authorization and depending on the specific requirements of the national laws for collecting/exporting etc. The documentation offices assign permit registration numbers for each collecting event or exchange lot. All permit documents belong to one or multiple registration numbers. By this process we ensure that genetic material is identified by collecting number (assigned by the collector), by accession number (assigned by BGBM according to type of material e.g. plant tissue, DNA, sample, seed lot, plant accession number of living plants, environmental sample, culture strain or herbarium specimen), and, most importantly in this regard, the document number/identifier of the legal or formal documents issued by the national legal entity or signed by a partner institution (assigned by the documentation office at BGBM when digitized). All these identifiers or numbers must refer to the respective material and as such allow BGBM to trace back the material at all stages of processing and also when genetic material is exchanged with partners. If there are any restrictions or any requirements for the further processing, use or exchange of plant material this is documented and flagged in all database modules and accession numbers. In the living collections of the botanic garden for example we apply the IPEN protocol (see link for more details) where the IPEN-number (0 or 1) indicates if there is any restriction to the accession. Fig. 3. Section from the Collection Data Format Tool that accompanies all material that enters our collections.